Sheffield Children’s Hospital has unveiled its brand new £200,000 hydrotherapy pool, which was built following a successful fundraising campaign. The new pool, which is located at the Ryegate Children’s Centre, and was opened by Paralympic gold medallist, Oliver Hynd, aims to help disabled youngsters develop their skills and strengthen their bodies. This new facility replaces the centre’s 50-year-old pool and boasts a contemporary design with an accessible sunken bathing area, complete with underwater lights and an improved hoist system. 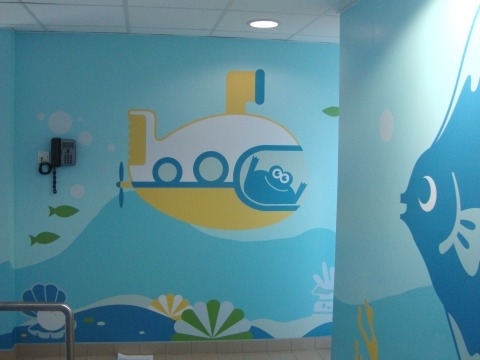 Signs Express (Sheffield) worked closely with Cat Powell, Artfelt Manager at The Children’s Hospital Charity, by suggesting how graphics could be used to enhance the ambience of the pool area in the first instance and also advising on the most suitable materials and printing methods. As the pool area has very high humidity levels, it was decided that speciality paint would need to be applied to the walls to aid adhesion of the printed graphics. 40 metres of full colour printed Hi Tac vinyl. Carol Morris, owner of Signs Express (Sheffield) said: “It has been a joy to be part of this project. 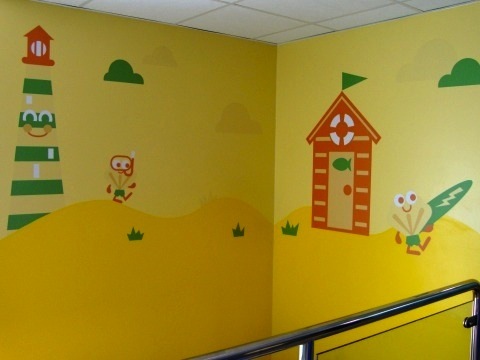 We worked with key members of the Artfelt team and hospital staff to ensure the right decisions were being made and the end result is a wonderful environment for the children”. played a key part in the pool’s transformation and we are extremely grateful for their help,” while. Jenny Featherstone, team leader for community physiotherapy and occupational therapy at Sheffield Children’s NHS Foundation Trust, added: “We are immensely grateful to all of the people who have been involved in this project. The new pool has provided us with a bright, fresh, fun environment that will help transform hydrotherapy for all involved”.